Posted on May 12, 2017 by Marjorie Munroe CommentsNo Comments on Investigate? Interrogate? Hesitate! Investigate? Interrogate? Hesitate! | Marjorie Munroe | DisruptHR Talks from DisruptHR on Vimeo. Many organizations are trapped in a cycle of reactive, formalized conflict resolution. Does that describe you? It is time to break the cycle. An internal workplace review of the Calgary Police Service revealing claims of sexual assault, sexual harassment and bullying has been released recently by Post Media. Though three years old, this report has launched an important public discussion which needs a much broader focus than the Calgary Police Service which has been working hard to institute changes. It can be a struggle for organizations to shift an unwanted culture. “It’s clear this culture exists…” Marlene Hope, a former Calgary Police Officer is quoted in Yolande Cole’s Calgary Herald article of October 26. Cole’s article strikes a chord. The Calgary Police Service is not alone as an organization which struggles with shifting an unwanted culture. Organizations try a number of different ways to address it, such as for example a whistle-blowing line. Ultimately though it is how the complaints are handled that makes the difference. What is critical is that employees in any organization have choices and avenues they trust to turn to when they believe they are being treated unfairly. One such option that has helped many organizations is the organizational ombudsman, an office which when set up well, is independent, impartial, and has unfettered access up and down the width and breath of the organization. Such an office can provide an informal, confidential, and impartial avenue for employees to raise their complaints and seek resolution through a fair and transparent process. An office with such access can also provide the all-important service of oversight in the organization. We need to continue this conversation in Canada on a broader scope. Each time I read an article like this, I am reminded that we have a long way to go in structuring organizations with conflict management systems which provide employees with the support they deserve and they need. Very few organizations have invested in the Ombuds function, yet it can have a clear bottom-line impact and support organizations who are focusing on providing a psychologically healthy workplace. I appreciate Cole’s article and I do hope it continues to foster this discussion. You can find further comments about why employees don’t come forward here and information about organizational ombuds functions here. Posted on October 5, 2016 by Marjorie Munroe Tagged change fatiguechange managementmanagement	CommentsNo Comments on Is Change Fatigue a thing? Is Change Fatigue a thing? I don’t think it is well studied. In fact, a few weeks ago when a client mentioned that she thought change fatigue might be affecting her organization, I wondered — is it a thing? Yes, I have decided. It is. And it is different and must be distinguished from change resistance. I am not alone in these thoughts. Some preliminary internet research has revealed that though not well-studied, it is noticed. In 2015, Ketchum conducted a survey among senior leadership executives and learned that 74% say change fatigue exists within their organization. Within those 39% say it is highly prevalent. Change is not going away. It is critical to business success, and particularly prevalent in these challenging times here at home in Calgary. Multiple, persistent, unpredictable changes lead to workplace stress and fatigue. Change resistance occurs when people perceive a threat to the status quo. It often occurs within the context of traditional command and control change initiatives. There is a struggle, the Ketchum survey reveals, with gaining input across business units. People who do not feel involved, or who do not understand the initiative and/or its vision, become disengaged and productivity decreases. Change fatigue, on the other hand, occurs when there are many change initiatives happening at the same time, and they compete for the same resources. Or it occurs when there are a series of change initiatives collapsing one onto the other with no time in between for processing and assessment. People may buy into the change initiatives, but are affected by the stress of unacknowledged adoption challenges, and lack of time to process one change before moving on to the next. As frustration and exhaustion mount, employees may become disengaged. Why is it important to distinguish the difference between change fatigue and change resistance? In both cases the organization loses valuable knowledge. The signs can look similar, increasing disengagement and apparent apathy. However, the support for each, while sharing some similarities, looks different. Employees experiencing change resistance, and employees experiencing change fatigue, need a forum for providing input and sharing how the change initiatives are impacting them. With change resistance, uncertainty is a big factor. Discussions may focus on risk management and support. Helping them to visualize in a very concrete way the long term goals can be very helpful. Change fatigue needs to be addressed more globally. Establish a community of workplace participants who are sharing similar experiences. Take time to celebrate successes before moving onto new initiatives. Provide resources to help employees deal with exhaustion and stress. At one time or another we have all heard it – that accusation around missing accountability: “No one is holding them accountable!” We have an expectation that accountability has to be made visible through punitive actions. Stephan Brandt of Door Training has a different view, and it is refreshing. It does require a paradigm shift: connect accountability to clearly defined results, not to a failure to achieve. Lion up for accountability – there is no wizard. Recently Stephan joined us for lunch, and I am sorry if you missed his enthusiasm and passion for a subject which hits many of us hard in the workplace. His talk was based on The Oz Principle a book by Roger Connors, Tom Smith and Craig Hickman. Dorothy, Scarecrow, Tin Man, and Lion all have a role to play in accountability. Ultimately, the authors remind us that accountability is a personal choice. Our brain does much of its work underwater, in other words, unconsciously. We learned from Stephan about above the line and below the line behaviour. Below the line behaviour includes blaming, stalling, and ignoring and results in victimization. Above the line behaviour is about actions, and importantly, results. The below the line behaviour is defensive. As we protect ourselves, we unwittingly and unconsciously create victims. This behaviour is destructive. Stephan reminded us that this thin line separates success from failure. Shifting above the line from the victimizing blame game to accountability requires finding courage like the Lion to retell the story. It requires finding a heart, like the Tin Woodsman to own it and like the Scarecrow, finding the wisdom to solve it. Finally, like Dorothy, you need to do it. I am reminded that the Wizard could not help Dorothy; she had to find the means to do it herself, and she had it all along. So how do you close your accountability gaps? How do you help others find the courage to see things differently and the wisdom to look for new solutions? The powerful & reliable way to close Accountability Gaps, according to the authors is to follow the Steps To Accountability and the inspiration of the Oz characters: See It, Own It Solve It and Do It. Posted on April 28, 2016 by Marjorie Munroe Tagged Break Through to YescollaborationDave Savageleadership	CommentsNo Comments on Embrace Your Enemies, and Collaborate! Embrace Your Enemies, and Collaborate! Dave Savage is a mass of contradictions – hippy from the Kootenays (me too), businessman, capitalist, activist. In short, he is a disrupter. 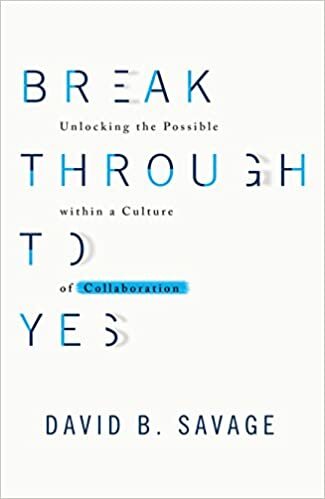 In his latest project, the book Break Through to Yes, Dave and his cohort (including my colleague Michelle Phanuef) tackle the collaborative juggernaut. Collaboration is the holy grail of leadership and insight, and yet it can be elusive. A few weeks ago, Dave began our luncheon discussion by inviting each of us to consider the question – How can we help you with your collaboration? This is Dave at his best – engaging and open. A cornerstone of collaboration is of course, asking for help, and setting aside egos. Set aside your ego, and seek contrarian thinking. This message resonated with me from our recent talk. It is required if you want to effectively embrace the 10 steps of collaboration outlined in Break Through to Yes. Collaboration is a system; it is not an event. The 10 essential steps provide concrete steps for building a culture, learning together and creating a breakthrough in thinking. Dave wrote his book about collaboration through a collaborative process. He has engaged, and continues to engage, a wide range of people about collaboration with the goal of understanding it more deeply and, in his words, to evolve the discipline of working together. How comfortable are you when you don’t know the outcome? It is counterintuitive – not knowing implies ignorance or even negligence. For Dave, not knowing is an invitation to learning. He asked us this provocative question, as he asks any CEO who wants to work with him. The goal is to view a problem with beginner’s eyes and to meet it without judgement. How comfortable are you? How do you include the people who are trying to get you to fail? Dave told us some good stories about engaging the enemy. He has been challenged in one of his many guises – an executive from the oil patch? This is California! You can’t help us! What is that gas guzzler you are driving? Dave engages his clients to think provocatively and to embrace the enemy. To embrace conflict, to seek diversity, to engage others with an open heart, requires designing collaboration to include those who are trying to get you to fail. So, embrace your enemy, and collaborate! The other day I was sitting in my dentist’s chair with a sore mouth. I have been back a few times since Christmas. Chasing pain in your mouth seems to be an inexact science. Have you had the cold test? If you have teeth like mine you face it with fear. Perhaps you should see a specialist, I heard. They can test you with dry ice, at -60 degrees! I don’t need any more encouragement to avoid that option. I have a collaborative dentist. It doesn’t always work for me. I have a collaborative dentist. You would think, given my vocation, this would please me. But as I sit in the chair with a sore mouth and hear that there is not a definitive solution, that I will not be told what to do, that I have a choice to demand a root canal, ignore it, see a specialist (or, presumably, yank it?) I just think YOU tell ME! YOU are the EXPERT. So I get it when I look at my client and their eyes glaze over when I say – this is a collaborative process. You are part of the solution. I am here to help you define a solution that will work for YOU. It sounds pat, and frankly, a little too mystical. I just need you to fix it. Damn it. Collaboration is an inexact science. Research proves again and again that organizations which collaborate effectively are more profitable, have more engaged employees, are more efficient. But we have all experienced the frustration that ensues from apparently endless committee work and questions which never seem to lead to concrete solutions. I think we get frustrated because we confuse cooperation with collaboration. We use the terms interchangeably, but I can be cooperative without being truly collaborative. If I cooperate with my dentist, I will not challenge him. I will work with him. I will make my decisions. I will listen to his advice, but I don’t bring any more knowledge or expertise to the table to help inform our interactions beyond my own pain experience. True collaboration requires a much bigger investment. I need to challenge his process, advocate for my own health, research tooth decay and consult with other dentists, returning at my next appointment with my own expertise. Do we all need to be experts to collaborate? Perhaps not. But true collaboration is a resource intensive activity that requires serious questioning and exhaustive challenge and openness. To truly be collaborative with my dentist, I need to be confident in the belief of my own expertise around my oral health, and be prepared to challenge and advocate in his process as well as his method. Posted on March 14, 2016 by Marjorie Munroe Tagged albertaeconomic downturnemployee engagementjob cutsleadershipmanagement	CommentsNo Comments on Hunkering Down & Cutting Back – Where is the fairness? Hunkering Down & Cutting Back – Where is the fairness? Here in Alberta we are confronting a new possible normal…in 2 to 3 years back to oil at $45/barrel? We are staring at a 7.9% unemployment rate – the highest since August 1995, and the natural resources/mining sector has been hard hit with losses of some 15,200 jobs in the past year. Wilma Slenders of Transcend Management Advisors Inc hosted a very interesting discussion with us recently, and we examined the behaviour and the reaction in the Calgary workplace to the depressing economic environment. To set the context Wilma reminded us that as Milton Friedman asserted in 1970, that the sole purpose of a business is to make a profit for shareholders. While we may disagree that it is its sole purpose, without profitability businesses would not exist. At a recent Soul of the City event (hosted by Calgary Economic Development) discussion centred around the economic challenges and the fact that Calgary is not known for innovation. As the pressure increases, companies are hunkering down and cutting back. One would think that a natural reaction would be to innovate, however, a quick survey around the table did not reveal much evidence of innovation. As the pressure increases in Alberta companies are hunkering down and cutting back. So we talked lay-offs, using as the basis for our wide-ranging discussion several case studies which Wilma introduced. For me, there were a few significant takeaways. Stress leads to poor decision making. Uncertainty leads to stress. We agreed that though it can be difficult, the worker who is able to take control of their own life will make better decisions and provide better support for their staff. We heard an example of the HR director who sees their name on the cut list and takes the bull by the horns to negotiate their package first before tackling the others. It takes courage! But it leads to certainty. “Don’t take it personally” is a phrase which will never land well. The leader who anthropomorphizes “the company” and uses that as an excuse can never get away from sounding pejorative. It is personal. The high performing team or individual can get isolated. When you are on sinking ship watching the captain load supplies onto a dinghy you know you can’t get on, it can test your spirit of generosity. Different business, and indeed different units of the same business, are having very different experiences in this downturn. Some are contracting and some are growing. When both are happening in the same company it is challenging. To keep staff motivated, managers must be transparent and open with the challenges they face. Involve employees in the decision making. This can be good for keeping employees engaged, but it can also be dangerous – as it is not always possible to keep promises made even with the best of intentions. When the price of oil changes, everything changes. Separate the people from the problem? This is a quote we use quite often in conflict resolution. One story shared tested this – the fellow who arrives at “the meeting” with the spreadsheet of metrics & performance statistics to make the cut decisions, looking around the room. Didn’t you bring your spreadsheet? he says to the others. No. We know who has to go. All decisions are made at some level on emotion and gut instinct. Every company facing cuts is facing complex decisions – laying off the high performer to save the job of the new parent? This is a problem that cannot be separated from the people. There are no rules for this new normal. We struggle with a larger than ever and uncontrollable circle of concern. As we grapple to enlarge our circle of influence, our values will be tested, our security will be tested, and so will our conscience. Hang on, it is going to be quite the ride; it isn’t over yet. Through Transcend Management Advisors Inc. Wilma Slenders provides professional objective guidance for growth and change.